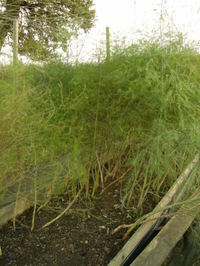 The asparagus bed has been in four years now and this summer I harvested freely until June, stopping then to let the spears grow on to this frondy mass, building up reserves for next season. The two rows are not the same length - the one to the right is shorter where two crowns failed to grow on in the first year. I've never bothered to replace them and instead I use up the space planting any suitable oddments left over from elsewhere. This year is was a couple of sweet pea (they liked it here and hopefully didn't take too much away from the crowns - we'll see next summer) and some garlic left over from the main planting. Previously I've grown dwarf beans and they seem to have liked it as well because of the generous amount of compost I spread on the bed each winter. It's also where there is a seam of heavier, moister soil and maybe this is why the missing crowns rotted off. Now that they were beginning to yellow off it was time to cut them down and dress the bed and let them overwinter with the prospect of another good crop next summer - a real bonus of growing your own. Here they've been cut to ground level and dressed with compost. The stakes mark the end of the row and in the remaining space I'll probably sow a catch crop of lettuce or put in some beans again - just three or so plants, maybe some raddish or I'll try and raise a few brassica seedlings. 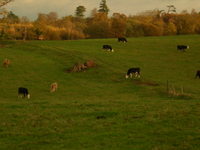 In the field next to the allotments the cattle did what they do best - eat. 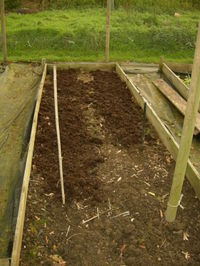 Hello Joanna, I'm gardening mostly on greensand so a very light soil that needs lots of manure but as I mentioned in the post there are a few seams of heavier clay dotted about. Oh for that space! Looks lovely...when did you plant the cows?! ---Trade secret that. I will say it's difficult to keep them still!